This is a fall favorite item for Thanksgiving and super warm. The orange corduroy jumper has a very cute applique turkey on the front and a brown with ivory polka dot bow on the right shoulder. 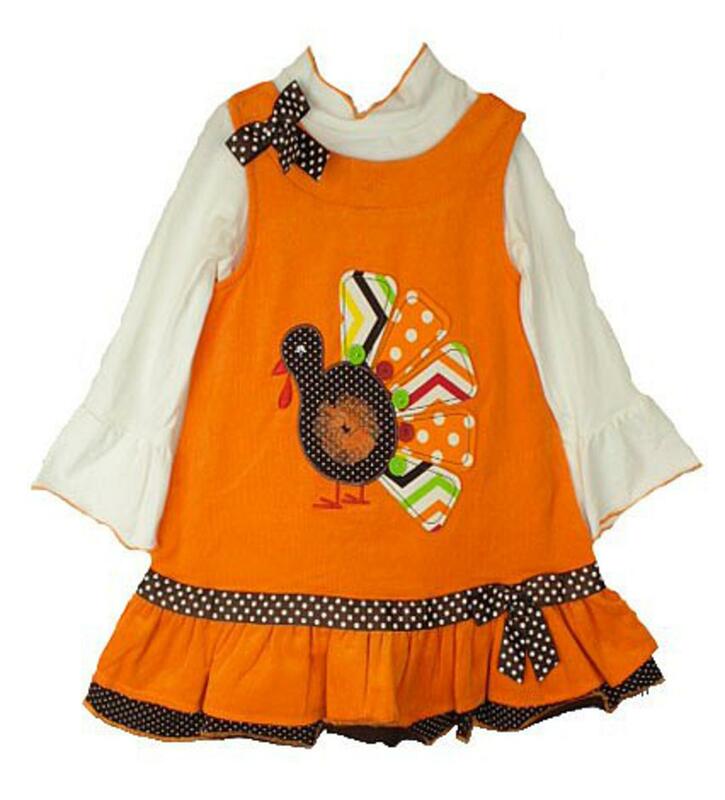 The turkey is brown with ivory polka dots and has decorative feathers with buttons. The wings are orange tulle and the eye is a jewel. The dress has three rows of ruffles, brown with ivory polka dot ribbon, orange corduroy, and brown with cream polka dot. There is an longsleeve onesie underneath that has a orange decorative trim on the neckline and sleeves. The sleeves also have large ruffles. There is snaps on the bottom to accomodate a diaper change easily and a zipper on the back of the dress to get over a childs head. The dress is 100% cotton and the onesie is 95% cotton and 5% spandex.